Raja Bell's most (only?) notable stretch for the Mavs was in the 2003 playoffs. 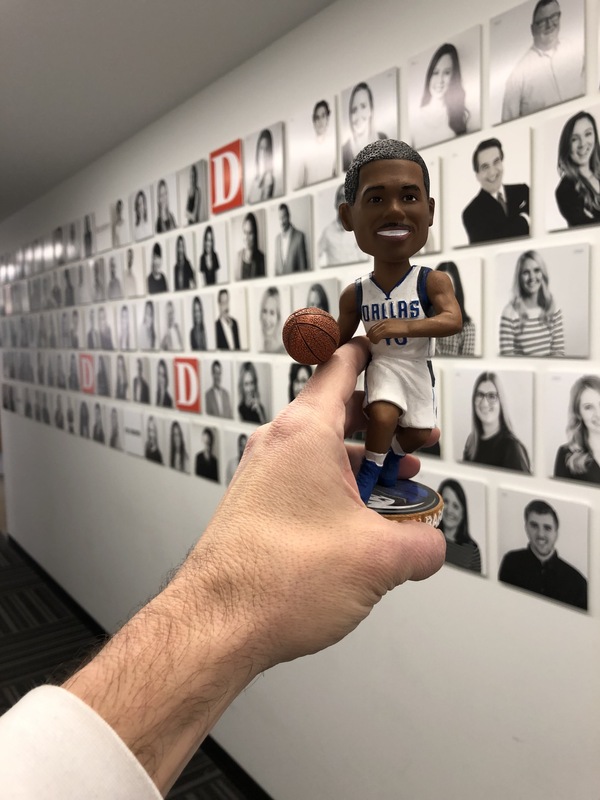 The Harrison Barnes bobblehead that doesn’t look much like him says goodbye to the D Magazine staff. Harrison Barnes was traded Wednesday night — during (omg) the Mavs’ game against Charlotte Hornets — to the Sacramento Kings. Harrison Barnes was a solid player who was kind of a ball stopper and a really good guy in the community. I almost rode bikes with Harrison Barnes once for a story. Harrison Barnes has a great nickname — Black Falcon — that I think he gave to himself, that he never uses anymore. We wish Harrison Barnes well. Last season, or maybe the season before that, we acquired a Harrison Barnes bobblehead. I am 98 percent sure the Mavericks sent it over. Probably Erin Feingold, if I am continuing to make educated guesses. Anyway, like some bobbleheads, it doesn’t really look like Harrison Barnes that much. It’s not the bobblehead’s fault. It’s no one’s fault, really. That’s just the game. Anyway anyway, today, just now, in fact, it said goodbye to the D Magazine offices, because I am going to send it to Sacramento Magazine. I assume they have such a thing. Honestly, between, you, me, and our CMS, I’m just writing “Sacramento Magazine aka S Magazine aka Sacramento Monthly” on a box and hoping it gets to who needs it. 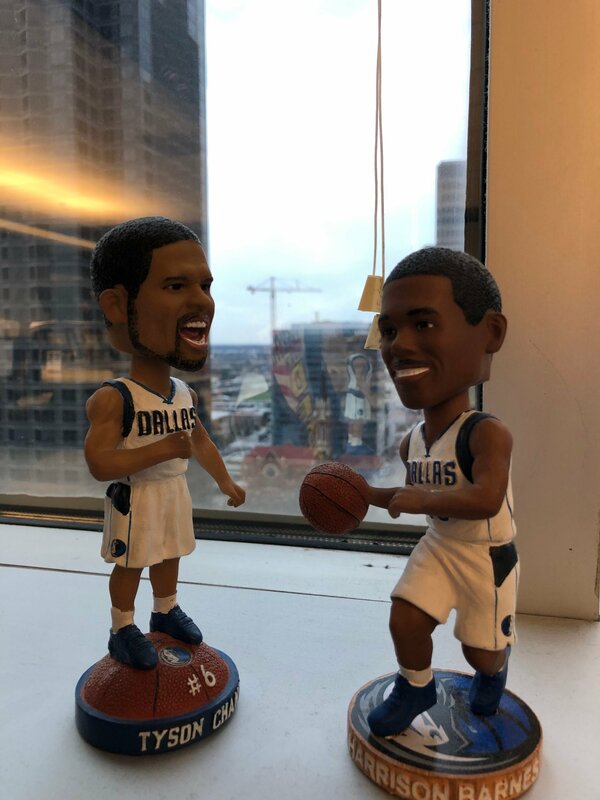 The Harrison Barnes bobblehead that doesn’t look much like him says goodbye to the Tyson Chandler bobblehead that doesn’t look much like him. 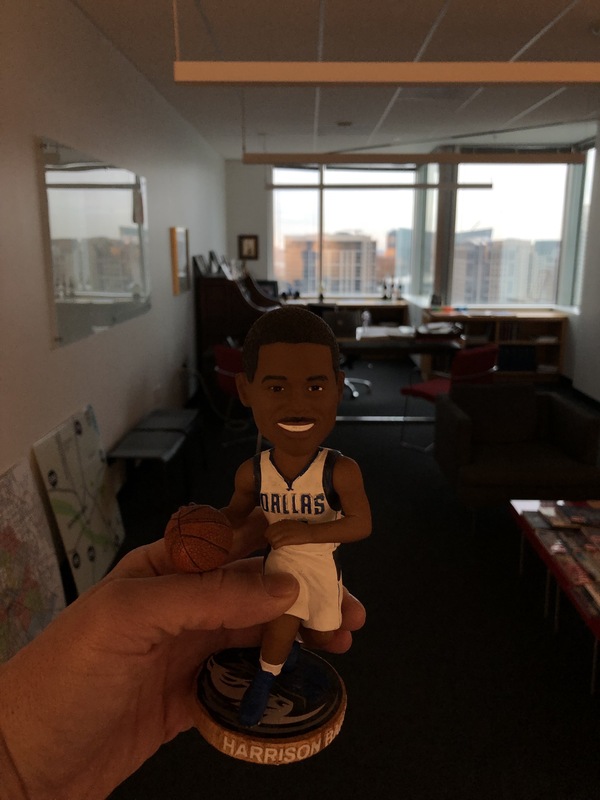 The Harrison Barnes bobblehead that doesn’t look much like him says goodbye to Wick Allison’s office. 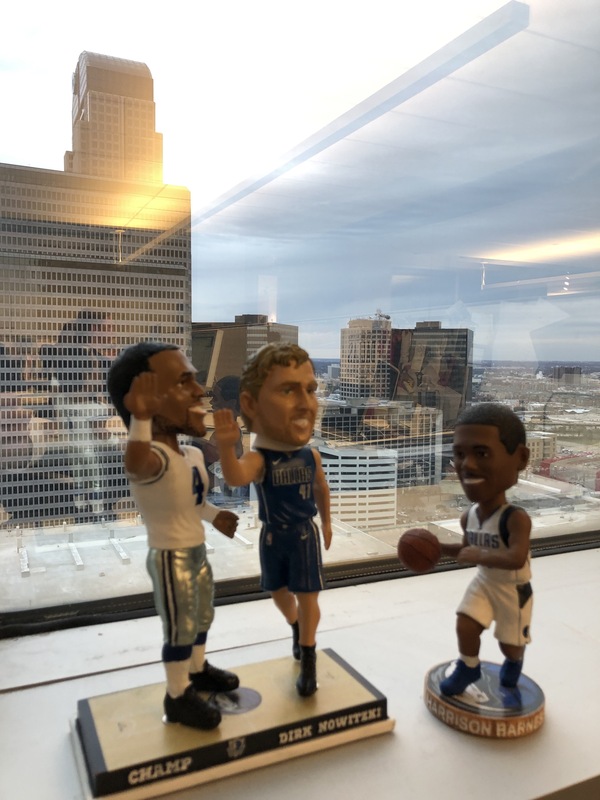 The Harrison Barnes bobblehead that doesn’t look much like him says goodbye to Dak Prescott and Dirk Nowitzki wearing a cervical collar for some reason. 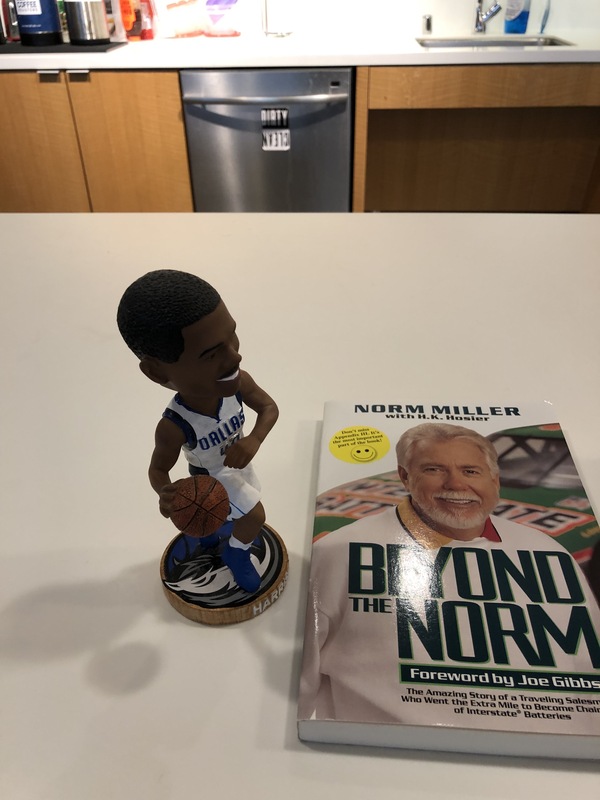 The Harrison Barnes bobblehead that doesn’t look much like him says goodbye to a copy of Beyond the Norm that just arrived at the office. I think. I don’t know. I didn’t really investigate this one. I guess it’s about Nascar? Not really clear. Who is Norm Miller? Is he a driver? He looks like someone who is going to help me fix my credit score. I mean that hypothetically. My credit score couldn’t really get any better. 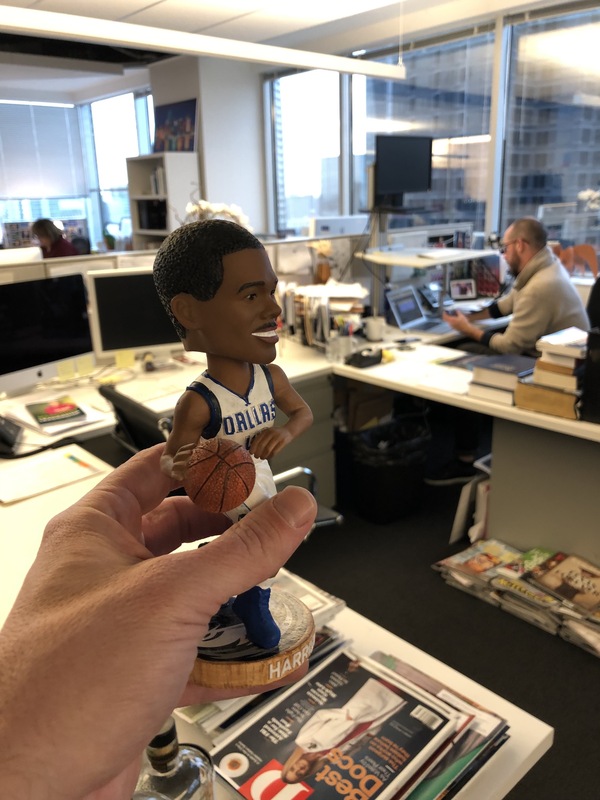 The Harrison Barnes bobblehead that doesn’t really look like him says goodbye to D editor Tim Rogers, who was on a seemingly important call but will no doubt regret not taking the time to offer the Harrison Barnes bobblehead that doesn’t much look like him a proper goodbye. Maybe not today, or whenever, if ever, he reads this post. But in a few days or weeks or maybe even months, oh yeah. Maybe not to the point of tears but maybe, yeah, maybe he will cry. I guess it depends on what kind of day it has been up to that point. Look, don’t ask me to take the emotional temperature of someone at a time that could be as much as a year in the future. I’m perceptive but not a witch. Or wizard. Are male witches just witches? Is witch sort of an all-purpose, gender-free term? If not, maybe it should be.